FORT BRAGG, NC. (THECOUNT) – Sgt. First Class Ethan Carpenter has been identified as the Fort Bragg soldier killed during “routine military free-fall training” at an Arizona facility on March 15. 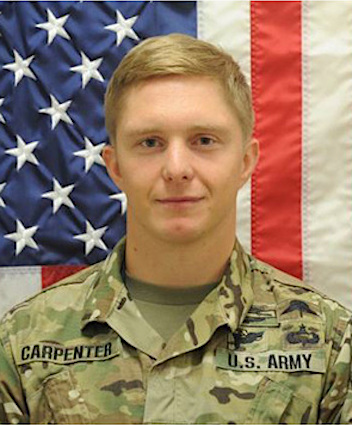 According to the United States Army Special Operations Command’s Public Affairs, Carpenter, who was from Trumansburg, New York, was a reconnaissance specialist assigned to the Regimental Special Troops Battalion. He joined the Army in August 2017, the Army said. Carpenter had been deployed to combat eight times: once to Iraq and seven times to Afghanistan. His awards include the Purple Heart, Joint Service Commendation Medal with OLC, Afghanistan Campaign Medal, Iraq Campaign Medal, Global War on Terrorism Expeditionary Medal, Ranger Tab, Military Freefall Parachutist Badge, Senior Parachutists Badge, Expert Infantryman’s Badge, and Combat Infantryman’s Badge, the Army said. “Sgt. First Class Ethan Carpenter was an exemplary Soldier and Ranger Leader, and a dedicated husband and father. He did the toughest jobs well and was the consummate team member when it counted the most, both in garrison training and in deployed combat. He represented our Nation’s best, and we’ll miss him dearly,” said Colonel Joseph Ewers, commander, Regimental Special Troops Battalion, reports WSPA. Geo quick facts: Fort Bragg, North Carolina is a military installation of the United States Army in North Carolina, and, by population, is the largest military installation in the world with more than 50,000 active duty personnel. The installation is located within Cumberland, Hoke, Harnett, and Moore counties – Wikipedia.